Combing through the history of these things, the last time an elevation to the Stateside church's top rank came as this much of a bolt from the blue, you'd have to go back to April 1997, when Francis George -- then archbishop of Portland in Oregon for all of ten months -- was sent home to Chicago in succession to Cardinal Joseph Bernardin. That is, until today... and this time, the now-Chief got to be the messenger. By the numbers, San Antonio's 700,000 Catholics might stack up closer to a vicariate of the 2.3 million-member Windy City church. As American Catholicism's traditional "Latin seat" -- and, accordingly, the "capital" diocese of the US fold's most rapidly growing faction -- however, the Alamo City's last three decades' worth of archbishops have tended to take on a larger profile on the wider stage than most of the nation's 32 metropolitans. In the wake of José Gomez's departure for Los Angeles, whether or not the Hispanic hold at San Fernando Cathedral would remain intact appeared to be a very open question. But just as B16's recent picks of Spanish-fluent Anglos to the Latino-heavy archdioceses of Miami and Seattle -- and, indeed, the pontiff's unprecedented selections of Latin bishops for the capitals of the nation's two largest states and, of course, the biggest diocese Stateside Catholicism has ever known -- serve to attest, a historic leap is taking place when it comes to the church's outreach to the bulk of its future: a Hispanic community whose members already comprise a supermajority of American Catholics under age 35. 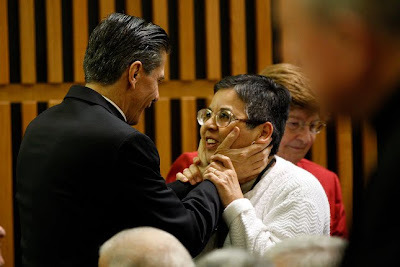 And in a nutshell, keeping San Antonio's Latin tradition -- for just the second time, giving the national church two active Hispanic archbishops -- only evidences it further. 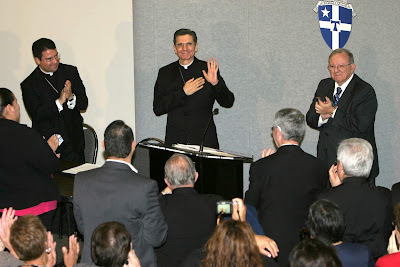 I thank God and the Holy Father Benedict XVI for appointing me the sixth Archbishop of San Antonio. I am also grateful to the Apostolic Nuncio, Pietro Sambi for his encouragement and guidance. I am thankful for the legacy of faith of the many bishops and the people of the Archdiocese of San Antonio. I particularly honor Archbishop Flores, whom I met several times in California, and Archbishop Gomez, my predecessor and friend, for their generosity in serving this local Church. 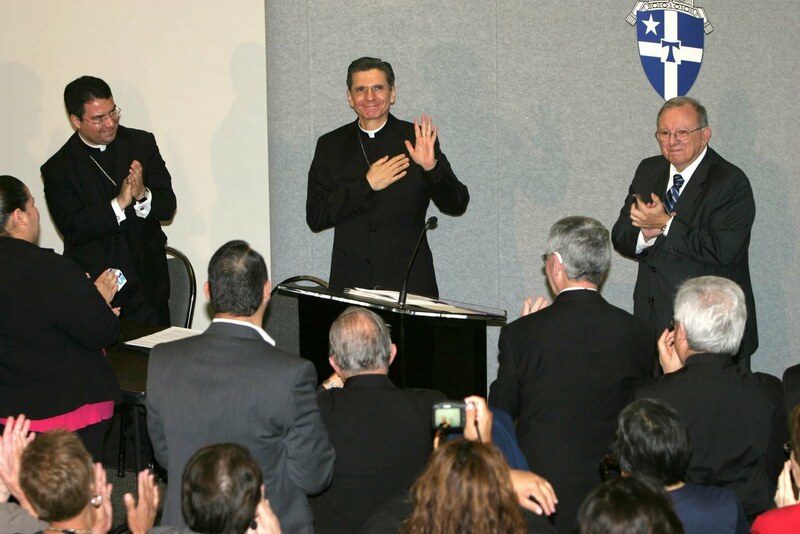 I thank Bishop Oscar Cantu for sustaining the life of the Archdiocese with good and consistent leadership. I am blessed by his support as a brother, friend and collaborator in ministry. I received the news about my appointment from Cardinal Francis George, Archbishop of Chicago. He invited me to his chapel, and in a context of prayer he voiced the will of the Holy Father. I felt the weight of the responsibility, but also the joy and peace that immediately fostered in me a desire to serve and say: YES, HERE I AM! It is the mission of Jesus and I embrace it! Since that day my joy has increased. I am delighted to serve the Lord in you, the people of the Archdiocese of San Antonio. I was born in San Luis Potosi, Mexico, a capital of over a million people in the central part of the country. I come from a large middle class family: my parents, 15 children and 25 nieces and nephews. I joined the Missionaries of the Holy Spirit in 1973 and I was ordained a priest in 1984. Since then I was sent to this country and happily became a U.S. citizen. I have been blessed through the years to work in parish ministry in dioceses in California and Oregon and have enjoyed giving missions of parish renewal in many states throughout the country. I have had the privilege to minister in several Dioceses in the U.S., mainly on the West Coast: California and Oregon. Pope John Paul II appointed me auxiliary bishop to the large and multicultural Archdiocese of Chicago in 2003. I have many friends there, and I have a profound gratitude to the Church of Chicago. People of San Antonio, you have 300 years of faith history, I am here to serve you. I pray that I will be useful to you as you strive to live your faith in years to come. May we grow together in holiness, and may collaboration be the hallmark of our work. We are priests and deacons, persons of consecrated life and laity, all building a Church of Communion. To some degree, I do understand your needs and I will grow in awareness of your challenges. I want to know more about you, my new Archdiocese. Above all, I want to love you. May we live our faith at all times and in all circumstances. I look forward to getting to know the broader community and its leaders, and pledge my support to work with you for the quality of life and the common good of all our people. I am also looking forward to relaxation and entertainment in my new home. I hope to be invited to some Spurs games. I might become a Spurs fan, myself! What about the weather? Coming from Chicago, I got a big break! It is like I won the lottery! Thank you! God bless you! 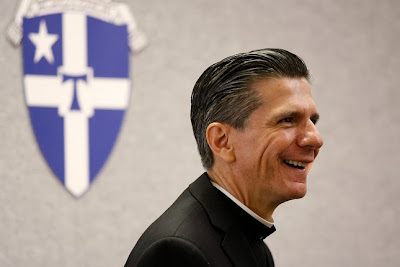 The above comes courtesy of Santone's Today's Catholic, which is running full-out coverage on its blog, including Gomez's blessing of his successor as "a wonderful bishop, priest and friend... a man of great faith and extraordinary pastoral sensitivity." For his part, meanwhile, the usually-quiet, always well-regarded apostolic administrator, San Antonio auxiliary Oscar Cantú -- all of 43, the nation's youngest bishop (and a blogger, to boot) -- said in his remarks that on learning of the Pope's pick, "I literally jumped out of my chair and made my best Spurs-like fist pump in the air, 'Yes!'" And in a rare, almost surreal, sense of common accord -- whether from Anglos or Hispanics, lay or ordained; on left and right, Chicago to California to Texas alike -- that's been the seemingly universal reaction to this move. "Io Sono Giuseppe, Vostro Fratello"